Mike Blalock is the President of Blalock & Blalock, P.C. Mike has an AV rating under Martindale-Hubbell's peer review rating system. This rating reflects the confidential opinion of members of the bar and judiciary regarding an attorney's legal ability and general ethical standards. An AV rating is the highest rating a lawyer can be given under the Martindale-Hubbell peer review rating system and means the attorney is considered to be in the top 5% of lawyers in America. 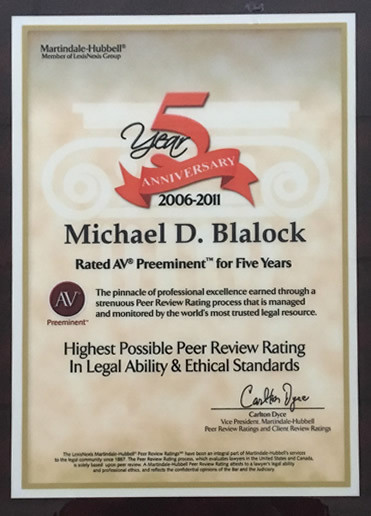 Since 1987, Blalock & Blalock, P.C. has focused a large part of its practice toward representing injured railroad employees. Since the firm's inception, it has worked long and hard to become proficient in Federal Employer's Liability Act (FELA), which is the unique law that governs railroad workers' on-the-job injuries. In 2007, the President of the union for railroad engineers and conductors (SMART) made Mike one of their thirty-three (33) nationally Designated Attorneys to handle their members' personal injury claims.